Impossibility is not a period at the end of faith's sentence. Faith, in the life of the believer, is meant to be tested. Without adversities faith will never become strong and overcoming. God has not planned crises, pain and disaster to enter our lives as a dead-end to faith's venture. Many situations vaunt themselves as "impossible", but when they are stripped from their "I" and "M" and become dependent on God, they become "God-possible". Live life victoriously as you learn to rely on God. Learn how to overcome all life’s obstacles. Watch depression and anxiety disappear. Understand why God is allowing you to experience mountains. 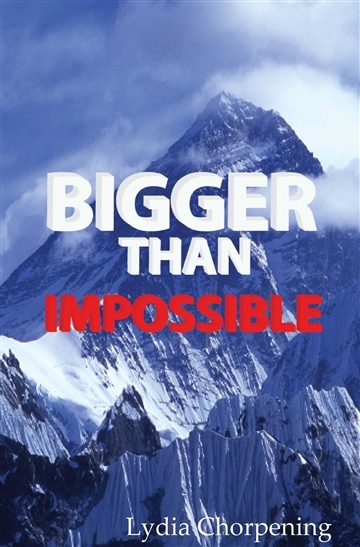 Each chapter of Bigger Than Impossible highlights a specific area of Lydia Chorpening's difficult past and contrasts it with Scriptures which make God bigger than the seemingly impossible. By utilizing the complete assurance of these Biblical concepts, you will develop your trust in the God who is bigger than impossible.